Posted April 10th, 2019 by alexa & filed under Families. I love this natural children’s portrait from a family photography session I did just before Christmas. The photoshoot took place in Richmond – we started in the family home and then went to a local park. I really enjoy photographing families outdoors as it allows the children to run around and let off steam. And it allows me to capture some really relaxed natural portraits of the whole family. During family photography sessions I encourage everyone to just relax and be themselves. There’s no need to pose and smile awkwardly for the camera. Instead I will catch the natural smiles as everyone plays together. Sometimes the family bring along their favourite toys to the photoshoot, which works well. Other times we just play games in whatever setting we find ourselves. I don’t like to plan the session too much in advance. Instead I’d rather just let the action of the day unfold and photograph it spontaneously. 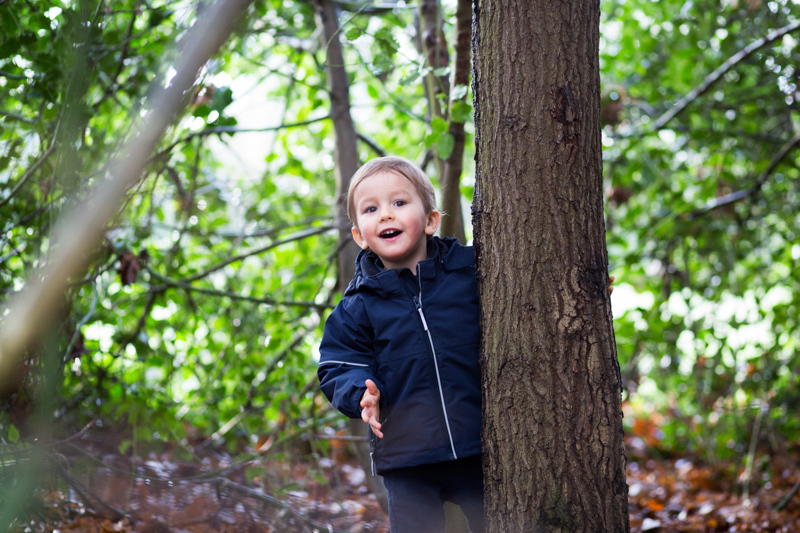 Natural children’s portrait during a game of hide and seek! After spending some time exploring the park we decided to play hide and seek. The little boy was having so much fun hiding amongst some trees. He peeped out from behind a tree to see if he had been caught yet and I love the joyful expression on his face. You have to act very quickly when photographing this way. Children this age don’t tend to stay still for very long, so you have to grab these moments when they come along. It makes the family photography session such fun and I’m always pleased to hear afterwards that the family enjoyed the experience of being photographed just as much as they love the finished images. The family from this Richmond photography session were overjoyed with all their photographs from our morning together. And I was delighted that this image was one they chose to go in a beautiful storyboard frame to hang up in their home and enjoy forever.